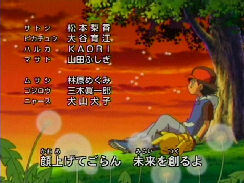 This is the first ending theme for the new Pocket Monsters series, Pocket Monsters Advanced Generation. It's a really slow and soft song, and I personally like it. "Koronde mo ii sa kimi wa kimi ga suteki sa"